On 23 March at around 1000 a seismic swarm began at South Sister that lasted ~48 hours. Over 300 volcano-tectonic earthquakes up to M 1.9 were recorded. The earthquakes were located in the NE quadrant of the area of on-going uplift. 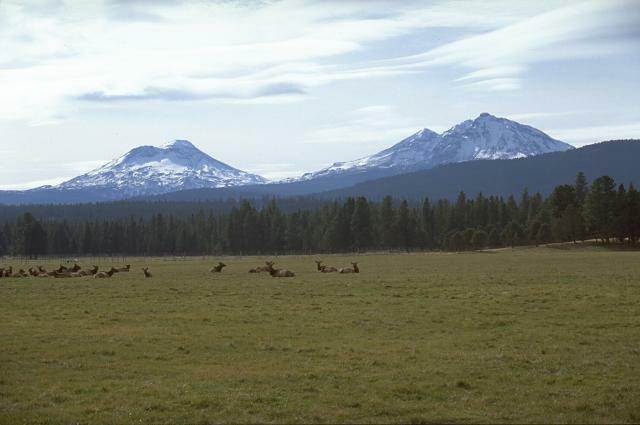 According to the U.S. Geological Survey, field surveys indicated that the uplift of the broad area in the Three Sisters region of central Oregon, gradually swelling since late 1997 (BGVN 26:05), continued as of 14 December 2005. However, the swelling may have slowed somewhat during the past year. The area of uplift is 20 km in diameter and is centered 5 km W of South Sister volcano. The middle of the uplift rose at an average rate of 2.5 cm per year as a result of intrusion of a modest volume of magma 7 km below the ground surface. Seismic activity related to the uplift has been scant, except for a swarm of more than 300 small earthquakes in late March 2004 (BGVN 29:06). Volcanic gases released from the intruding magma dissolve in ground water so water in local springs and streams is slightly enriched in chemical components derived from volcanic gases. Scientists believe that periods of intrusion similar to the present one have occurred in the area before. The duration and outcome of the current episode are considered to be impossible to forecast, and only continued monitoring will show whether or not this episode of intrusion is slowly ending. Investigations during 2005 showed the following. (1) Earthquakes continued at a low rate?only five were located in the uplift area in 2005; these were small, up to M1.5. (2) The chemical composition of local spring and stream water remained unchanged from that of the past 5 years. (3) Uplift of the ground surface continued, but seems to have slowed from the rate observed in past years. The three techniques used to measure ground deformation, all having a degree of uncertainty, together suggest that the rate decreased in 2004-2005, perhaps by as much as one half. If so, the rate of intrusion of magma has declined as well. 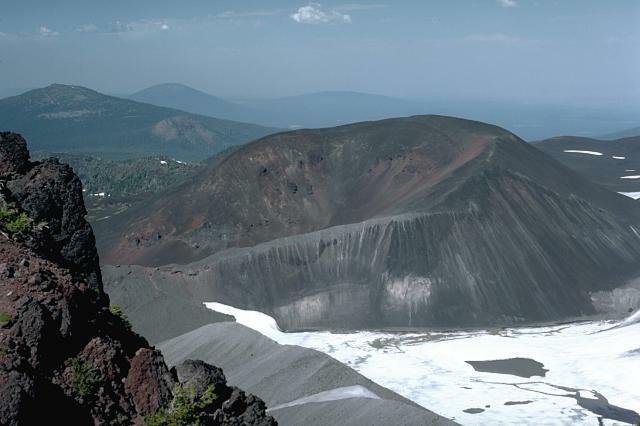 Information Contacts: Cascades Volcano Observatory (CVO), U.S. Geological Survey, 1300 SE Cardinal Court, Building 10, Suite 100, Vancouver, WA 98683-9589, USA (URL: https://volcanoes.usgs.gov/observatories/cvo/). The USGS Cascades Volcano Observatory reported on 8 May that between 1996 and 2000 they detected slight uplift of the ground surface over a broad area 5 km W of South Sister volcano. The uplift occurred over an area ~15-20 km in diameter and the maximum amount of uplift at its center is ~10 cm. CVO personnel believe the uplift may reflect intrusion of a small volume of magma at ~7 km depth beneath the ground surface. They stated that if the intrusion of magma continues it could eventually lead to a volcanic eruption, but precursory activity would most likely occur beforehand. There is no precursory activity that suggests an eruption is imminent; seismic activity at the volcano is near or below background levels, gas emissions are low, and no unusual surface changes have been observed. United States Geological Survey (USGS) scientists detected a slight uplift of the ground surface over a broad region centered 5 km W of South Sister volcano in the Three Sisters region (figure 1). The area is located within the central Oregon Cascade range, 35 km W of Bend, and 100 km E of Eugene, Oregon. The measured uplift, which occurred during 1996-2000, covered an area ~15-20 km in diameter; the maximum amount of uplift at the region's center was ~10 cm. Several close aerial inspections of the area revealed no unusual surface features. Figure 1. Radar interferogram showing ground uplift pattern centered ~ 5 km W of South Sister. Each shaded region represents ~ 2.8 cm of ground movement in the direction of the satellite. In this case, four concentric shaded bands show that the surface moved toward the satellite (close to vertical) by as much as 10 cm between August 1996 and October 2000. Data gaps occur where forest vegetation or other factors hinder the acquisition of useful radar data. A numerical model places the source of the uplift ~ 7 km beneath the ground surface. After a color version by Wicks and others (2001), which uses radar images from the European Space Agency's ERS satellites. The uplift was detected by using satellite radar interferometry (InSAR), which uses satellite data to make radar images of the ground surface (figure 1). InSAR can detect even minor (down to a few centimeters) changes in ground elevation over time. Images from 1996 and 2000 were compared and revealed the rise in ground level. The exact timing of uplift between the two dates, or whether it will continue, is unknown, but is being studied further. The specific cause of the uplift was also uncertain. Uplift in the Three Sisters region may reflect intrusion of a relatively small volume of magma at a possible depth of 7 km. If this is the result of intrusion, it indicates that the region remains active, but does not suggest eruptive activity without additional precursors. In the Three Sisters area, earthquake activity appeared to be at or near background levels and gas emissions were low as of May 2001. The USGS plans to enhance the existing monitoring network in the region to more accurately detect possible precursors and to better understand the uplift phenomenon. Installation of one or more additional seismometers, a global positioning system (GPS) receiver, a resurvey of existing benchmarks and installation of new ones, and periodic airborne and ground-based sampling of gases are all being considered. References. Wicks, C., Jr., Dzurisin, D., Ingebritsen, S.E., Thatcher, W., and Lu, Z., 2001, Ground uplift near the Three Sisters volcanic center, central Oregon Cascade Range, detected by satellite radar interferometry: in prep. 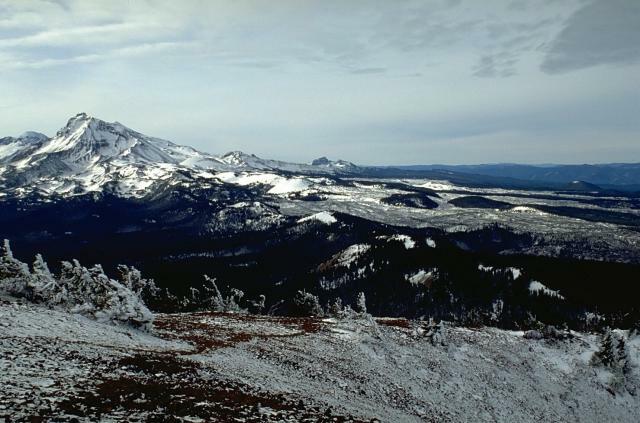 Information Contacts: Cascades Volcano Observatory (CVO), U.S. Geological Survey (USGS), 5400 MacArthur Blvd., Vancouver, WA 98661 USA (URL: https://volcanoes.usgs.gov/observatories/cvo/); Volcano Hazards Team, USGS, 345 Middlefield Road, Menlo Park, CA 94025-3591 USA (URL: http://volcanoes.usgs.gov/); Pacific Northwest Seismograph Network, University of Washington Geophysics Program, Box 351650, Seattle, WA 98195-1650 USA (URL: http://www.geophys.washington.edu/SEIS/PNSN/); Oregon Department of Geology and Mineral Industries, 800 NE Oregon St., Suite 965, Portland, OR 97232 USA (URL: http://www.oregongeology.org/sub/default.htm). 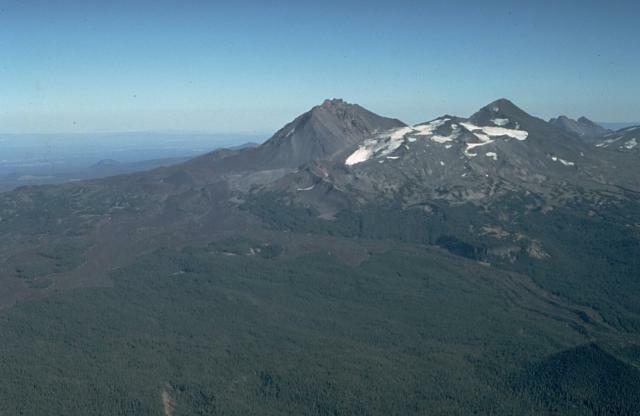 Uplift (up to ~10 cm) occurred during 1996-2000 over a broad region centered 5 km W of South Sister in the Three Sisters region (BGVN 26:05). At the time scientists did not know exactly when the uplift had occurred, whether it would continue, or its specific cause. Although most of these questions remain, some new data are available. 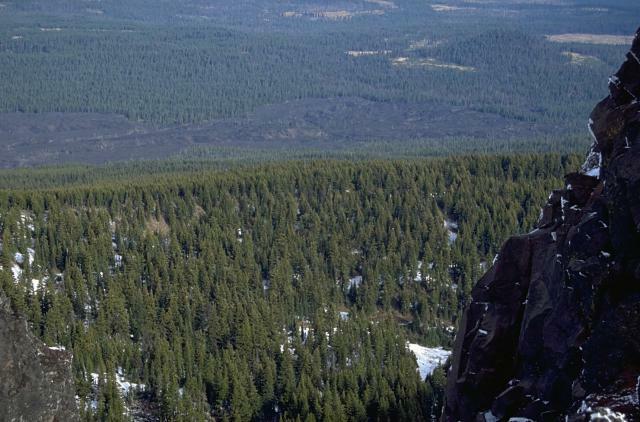 On 18 March 2002 scientists from the USGS Cascades Volcano Observatory and Central Washington University reported that they, in cooperation with staff from the U.S. Forest Service's (USFS) Willamette and Deschutes National Forests, confirmed that slow uplift of the area was continuing at approximately the same rate as previously reported (i.e., a maximum rate of ~2.5 cm/year). About a month later NASA's Jet Propulsion Laboratory (JPL) released a simulated natural-color image from the Aster high-resolution imaging instrument on the satellite Terra. 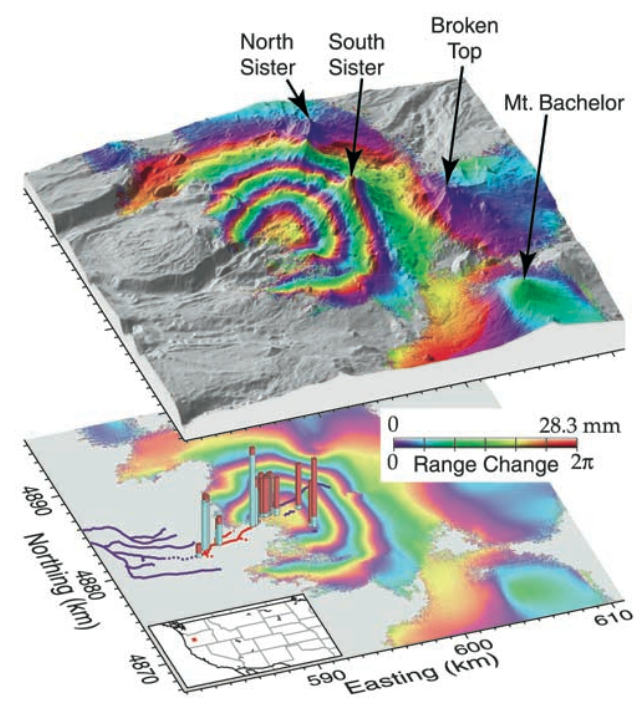 Aster uses 14 spectral bands, at wavelengths from visible to thermal-infrared, and it has a spatial resolution of 15-90 m. By draping the Aster data over digital topography from the U.S. Geological Survey's National Elevation Dataset, they created a new perspective view of the Three Sisters and adjacent Cascade volcanoes (figure 2). The image was timely because of concerns about continued uplift in the area. BGVN 26:05 included a radar interferogram showing ground uplift pattern during 1996-2000, movement centered ~ 5 km W of South Sister. Figure 2. The Three Sisters volcanic area appears in this perspective view from the SW quadrant. The view uses a simulated natural-color image from the satellite-borne Aster imaging system, which has been draped over digital topography taken from the U.S. Geological Survey's National Elevation Dataset. N lies to the upper-right; the distance between the summits of North Sister and South Sister is ~ 7 km. The image was released on 12 April 2002. Courtesy NASA's Jet Propulsion Laboratory. Analyses of spring water samples collected during late summer 2001 were similar to those from earlier surveys but isotopic studies of carbon and helium in the most recent samples, which were not done previously, suggested a magmatic source. Taken together, the ground deformation, seismic, spring water chemistry, and gas emission results suggest that uplift was caused by slow accumulation of magma at a depth of 6-7 km beneath the surface. If magma intrusion were to continue, it could eventually lead to a volcanic eruption; however, an eruption is unlikely without months to years of precursory activity. In addition to continued or accelerating uplift, precursors to an eruption would include earthquakes, typically swarms of small events generated by fracturing of rock as magma moves upward, and large emissions of volcanic gases, such as carbon dioxide, which is released from the magma. The Pacific Northwest Seismograph Network (PNSN) has reported three earthquakes in the Three Sisters region since January 2001. On 21 August 2001 a M 1.9 earthquake occurred at a depth of 4.9 km; on 5 November 2001 a M 1 earthquake occurred at a depth of 1 km; and on 18 January 2002 an M 2.4 earthquake occurred at a depth of 3.0 km. The recent earthquakes are consistent with background seismicity at Three Sisters. As of mid-July 2002, the number of earthquakes and gas emissions remained at low-t-obackground levels while steady uplift continued. General Reference. Scott, W.E., 1987, Holocene rhyodacite eruptions on the flanks of South Sister volcano, Oregon: Geol Soc Amer Spec Pap, v. 212, p. 35-53. Information Contacts: Cascades Volcano Observatory (CVO), U.S. Geological Survey (USGS), Building 10, Suite 100, 1300 SE Cardinal Court, Vancouver, WA 98683 (URL: https://volcanoes.usgs.gov/observatories/cvo/); Volcano Hazards Team, USGS, 345 Middlefield Road, Menlo Park, CA 94025-3591 USA (URL: http://volcanoes.usgs.gov/); Pacific Northwest Seismograph Network (PNSN), University of Washington Geophysics Program, Box 351650, Seattle, WA 98195-1650 USA (URL: http://www.geophys.washington.edu/SEIS/PNSN/); Jet Propulsion Laboratory, California Institute of Technology, National Aeronautics and Space Administration, Pasadena, CA 91109 (URL: http://www.jpl.nasa.gov/). 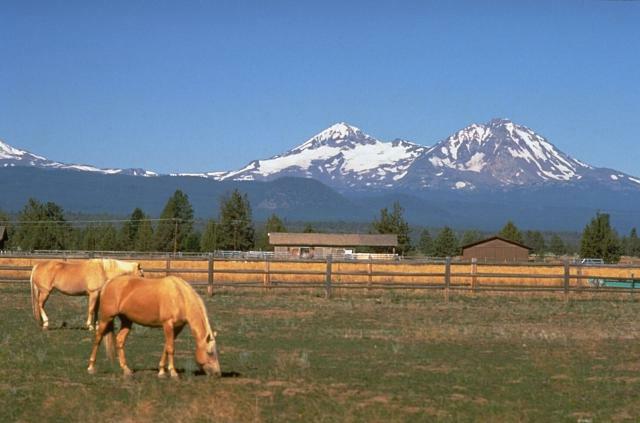 At approximately 1000 on 23 March 2004, a swarm of small earthquakes began at the Three Sisters volcanic center in the central Oregon Cascade Range. As of the morning of 24 March, the regional seismic network had detected ~ 100 earthquakes, with M ~ 1.5; by the end of the swarm, over 300 volcano-tectonic earthquakes with M ~ 1.9 were recorded (figure 3), with the rate of earthquakes peaking late on 23 March. The earthquakes occurred in the NE part of an area centered 5 km W of South Sister volcano, a zone in which the ground had been uplifted by as much as 25 cm since late 1997. Figure 3. Map of the 23-25 March 2004 seismic swarm at Three Sisters volcanoes. Courtesy of Pacific Northwest Seismograph Network (PNSN) website. Scientists inferred that the cause of the uplift was continuing magmatic intrusion ~ 7 km below the surface. The intrusion volume was estimated at ~ 40 million cubic meters. Until 23 March, only a few earthquakes had accompanied this process, but scientists predicted that swarms of small earthquakes would eventually accompany the uplift, and they suggested that the most likely cause of the earthquakes was small amounts of slippage on faults as the crust adjusted to the slow ground deformation that had been occurring since 1997. Heat and gases related to the magmatic intrusion also likely caused increases in fluid pressure deep underground, helping trigger minor faulting events. Scientists deployed another seismometer in order to locate earthquakes more precisely. They also planned additional fieldwork with the assistance of the Willamette and Deschutes National Forests, aiming to fix problems with some field instruments that resulted from a heavy winter snow-pack, and to assess sites for new instruments. Information Contacts: Cascades Volcano Observatory (CVO), U.S. Geological Survey (USGS), Building 10, Suite 100, 1300 SE Cardinal Court, Vancouver, WA 98683 (URL: https://volcanoes.usgs.gov/observatories/cvo/); Volcano Hazards Team, USGS, 345 Middlefield Road, Menlo Park, CA 94025-3591 USA (URL: http://volcanoes.usgs.gov/); Pacific Northwest Seismograph Network (PNSN), University of Washington Geophysics Program, Box 351650, Seattle, WA 98195-1650, USA (URL: http://www.geophys.washington.edu/SEIS/PNSN/). The north-south-trending Three Sisters volcano group dominates the landscape of the Central Oregon Cascades. 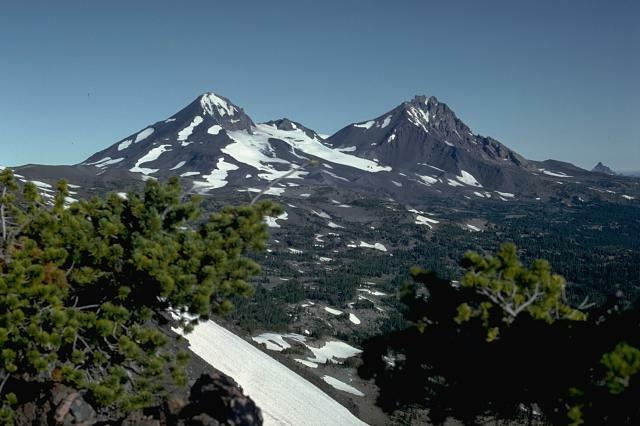 All Three Sisters stratovolcanoes ceased activity during the late Pleistocene, but basaltic-to-rhyolitic flank vents erupted during the Holocene, producing both blocky lava flows north of North Sister and rhyolitic lava domes and flows south of South Sister volcano. 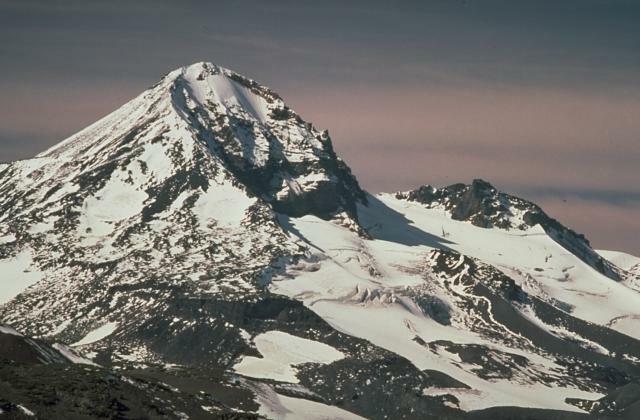 Glaciers have deeply eroded the Pleistocene andesitic-dacitic North Sister stratovolcano, exposing the volcano's central plug. Construction of the main edifice ceased at about 55,000 yrs ago, but north-flank vents produced blocky lava flows in the McKenzie Pass area as recently as about 1600 years ago. Middle Sister volcano is located only 2 km to the SW and was active largely contemporaneously with South Sister until about 14,000 years ago. South Sister is the highest of the Three Sisters. It was constructed beginning about 50,000 years ago and was capped by a symmetrical summit cinder cone formed about 22,000 years ago. The late Pleistocene or early Holocene Cayuse Crater on the SW flank of Broken Top volcano and other flank vents such as Le Conte Crater on the SW flank of South Sister mark mafic vents that have erupted at considerable distances from South Sister itself, and a chain of dike-fed rhyolitic lava domes and flows at Rock Mesa and Devils Chain south of South Sister erupted about 2000 years ago. This volcano is located within the Three Sisters, a UNESCO Biosphere Reserve property. Peterson N V, Groh E A, 1966. Lunar Geological Field Conference guidebook. Oregon Dept Geol Min Ind, 51 p.
Schmidt M E, Grunder A L, 2009. The evolution of North Sister: a volcano shaped by extension and ice in the central Oregon Cascade Arc. Geol Soc Amer Bull, 121: 643-662. Scott W E, Gardner C A, 1990. 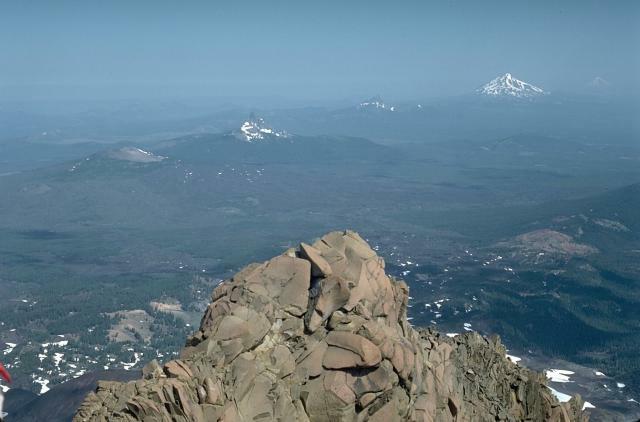 Field trip guide to the central Oregon High Cascades, Part 1: Mount Bachelor-South Sister area. Oregon Geol, 52: 99-140. Taylor E M, 1968. Roadside geology, Santiam and McKenzie Pass Highways, Oregon. Oregon Dept Geol Min Ind Bull, 62: 3-34. Taylor E M, 1981. Roadlog for central High Cascade geology, Bend, Sisters, McKenzie Pass, and Santiam Pass, Oregon. U S Geol Surv Circ, 838: 59-83. Williams H, 1944. Volcanoes of the Three Sisters region, Oregon Cascades. Univ Calif Pub Geol Sci, 27: 37-84. Williams H, 1957. A geologic map of the Bend Quadrangle, Oregon and a reconnaissance geologic map of the central portion of the High Cascade Mountains. Oregon Dept Geol Min Ind, 1:125,000 and 1:250,000 scale. Wozniak K C, Taylor E M, 1981. 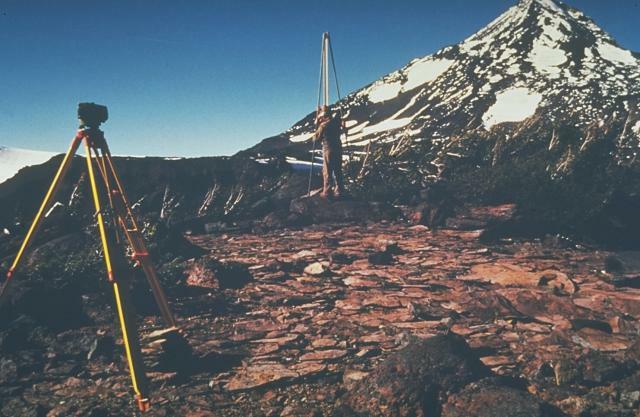 Late Pleistocene summit construction and Holocene flank eruptions of South Sister volcano, Oregon (abs). Eos, Trans Amer Geophys Union, 62: 61. There is data available for 7 Holocene eruptive periods. Remarks: Deformation is ongoing; rate varies with time. (Bottom) A location map (inset, red square shows location of study area) and geochemical data on top of the 1996? 2000 interferogram. The columns show chloride and sulfate concentrations at sampled springs. The lengths of the cyan columns depict chloride concentration (0.6 to 18.6 mg/L versus a regional background of 0.2 to 0.7 mg/L). The lengths of the red columns show SO4/Cl ratios (0.2 to 2.8). Blue lines highlight stream reaches with steady or decreasing Cl concentration in a downstream direction. Red lines highlight reaches within which Cl concentrations increase downstream. The color bar, which applies to all interferograms in this study, shows a range increase from 0 to 28.3 mm that corresponds to a continuous color change from violet to red. (Top) 1996?2000 interferogram draped over a 30-m DEM. From: Wicks et al. 2002. Reference List: Dzurisin et al. 2009; Wicks et al. 2002; Riddick and Schmidt 2011. There is no Emissions History data available for Three Sisters. An aerial view from the NW shows North Sister volcano (center) and Middle Sister (right) with young lava flows from north-flank cinder cones. The latest dated lava flow originated about 1600 years ago from Collier Cone, the lighter area in the center of the photo below the left flank of North Sister volcano. One lava flow lobe traveled to the NW; levees from the western lobe, which traveled 13.5 km down the White Branch Creek valley, are visible in the right foreground. Photo by Dan Miller, 1977 (U.S. Geological Survey). 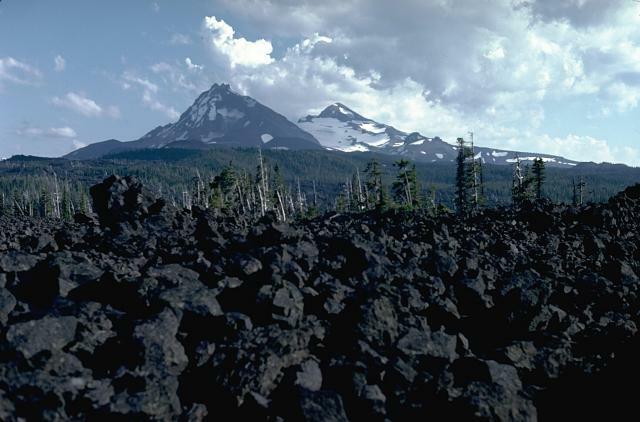 The McKenzie Pass area contains one of the largest concentrations of youthful volcanism in the continental United States. Fresh lava flows in the foreground from the Belknap shield volcano merge with unvegetated lava flows from cinder cones on the north flank of North Sister volcano in background, with Middle Sister to its right. Photo by Lee Siebert, 1982 (Smithsonian Institution). The Belknap Crater cinder cone provides an excellent panorama of recent volcanism in the McKenzie Pass area. Youthful lava flows from cinder cones on the north flanks of North and Middle Sister volcanoes in the background merge with flows from the Belknap shield volcano. Most of these flows were erupted in the past few thousand years. In the left foreground, lava flows from Belknap diverge around kipukas, islands of older rocks. North Sister volcano on the right and Middle Sister on the left, seen from Broken Top volcano to the south, are the two northernmost volcanoes in the Three Sisters volcano group in the central Oregon Cascades. Glaciers have deeply dissected the Pleistocene North Sister volcano, but young Holocene lava flows from cinder cones on its north flank have erupted in the past few thousand years. North Sister volcano on the right and Middle Sister to its left rise to over 3000 m above ranch lands of eastern Oregon. 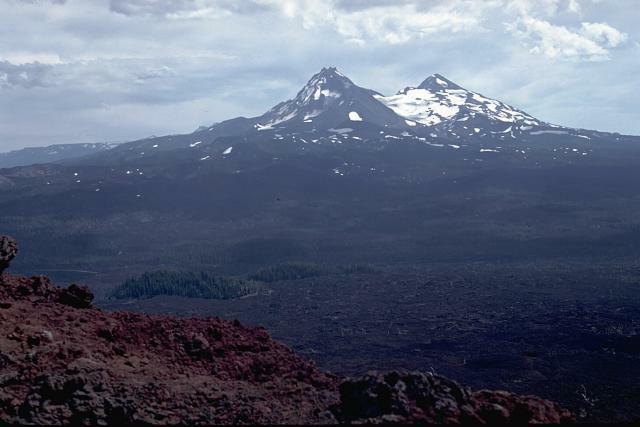 These large stratovolcanoes have not been active since the Pleistocene, but cinder cones on the north flank of North Sister volcano have produced some of the youngest lava flows in the Cascade Range. The Three Sisters volcanoes, all rising above 3000 meters, form the most prominent landmarks of the central Oregon Cascades. All three volcanoes ceased erupting during the Pleistocene, but flank vents of South Sister on the left and North Sister on the right have erupted in the past few thousand years. The north flank of North Sister volcano is dotted with young cinder cones that have produced lava flows, here covered with a light dusting of snow, in the past few thousand years. Yapoah cone, the symmetrical snow-covered cone in the center of the photo, produced a lava flow about 2600-2900 years ago that traveled beyond the margin of the photo for 13 km to the NE. Middle Sister volcano, seen here from the NE near the saddle between North Sister and Middle Sister, is younger than North Sister. However the steep cliffs forming the eastern flank of Middle Sister volcano show evidence of glacial dissection that exposes part of its dacitic central plug. Photo by Lee Siebert, 1984 (Smithsonian Institution). The summit of North Sister volcano provides a panorama of Cascade volcanism that includes, from left to right, the youthful lava flows of the McKenzie Pass area in the foreground, the low Belknap shield volcano capped by a cinder cone, the dissected summit pinnacles of Mount Washington and Three Fingered Jack volcanoes, and snow-capped Mount Jefferson at the upper right. 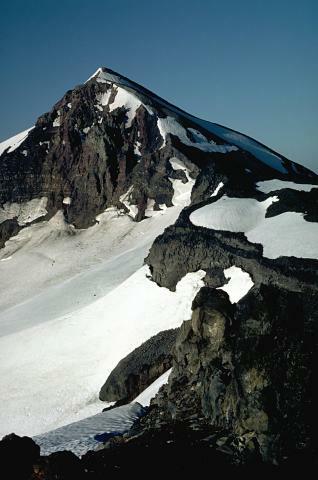 The horseshoe-shaped, breached Collier Cone on the NNW flank of North Sister, partially overridden by the Collier Glacier, was the location of the youngest dated eruption in the North Sister volcanic field, about 1600 years ago. Lava flows from this eruption traveled 5 km to the NW and 13.5 km to the west down White Branch Creek. The foreground portion of the cinder cone in this view looking NE has been partially eroded by Collier Glacier when it was at the level of the gray glacial moraine in the foreground at the left margin of the glacier. The lava flow cutting across the upper part of the photo, seen here from Black Crater, originated from Yapoah cone on the north flank of North Sister volcano about 2600-2900 years ago. The flow traveled 5 km to the north before being deflected by lavas from Little Belknap shield volcano and flowing an additional 8 km to the NE. 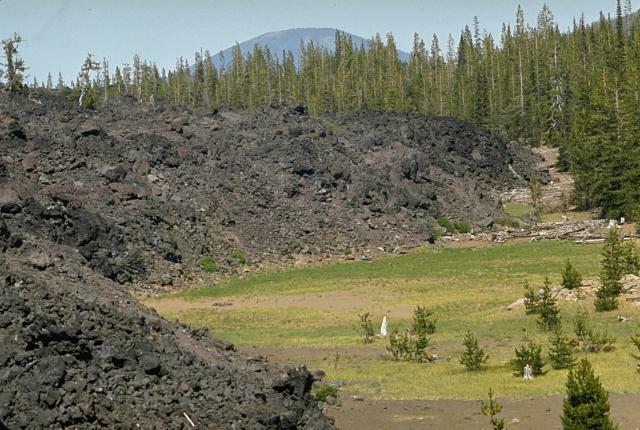 This blocky lava flow in the McKenzie Pass area of the central Oregon Cascades originated from Yapoah cinder cone on the north flank of North Sister volcano about 2600-2900 years ago. The flow traveled 5 km to the north before being deflected by lava flows from the Belknap and Little Belknap shield volcanoes and then flowed an additional 8 km to the NE. Photo by Lee Siebert, 1972 (Smithsonian Institution). U.S. Geological Survey scientists monitor deformation on the Three Sisters volcanoes in the central Oregon Cascades, with Middle Sister volcano in the background. Precise leveling that permits detection of minor uplift is one of several monitoring techniques used to predict eruptions. Photo by John Ewert, 1985 (U.S. Geological Survey). Middle Sister volcano, viewed from the west flank of Broken Top volcano on the SE, has a smoother profile than North Sister volcano to the right, but also shows evidence of glacial erosion on its eastern face, exposing part of the dacitic lava dome forming its central plug. Photo by Lyn Topinka, 1985 (U.S. Geological Survey). Large Eruptions of Three Sisters Information about large Quaternary eruptions (VEI >= 4) is cataloged in the Large Magnitude Explosive Volcanic Eruptions (LaMEVE) database of the Volcano Global Risk Identification and Analysis Project (VOGRIPA).